Do you know any pet owners who wouldn't like to have their own pets appear in a a novel? When I asked myself that question a few months ago, I couldn't think of anyone, so I pitched an idea to two organizations whose causes I strongly support: let's team up to raffle off guest parts for two dogs - one for each group's winner - in The Money Bird, my second Animals in Focus Mystery. I wrote about the raffles in my May 7 post, "Could Your Dog Be a Sleuth?" 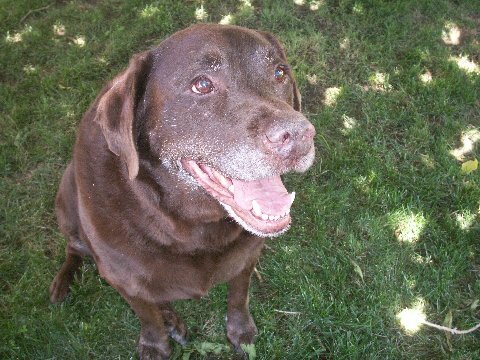 LABMED made $200 on the raffle, which will help with medical expenses for a rescued Lab. 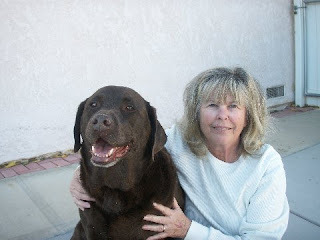 The winner of the LABMED raffle, seen here with his owner Diana Holman, is Lennen, a ten-year-old rescued boy who was turned in by his owners, who had kept him out in the backyard all his life. Aside from having landed in heaven with Diana, her six other Labs, and a comfy indoor couch to sleep on, Lennen has now landed a part in The Money Bird, my second Animals in Focus mystery. Doesn't he look pleased about the whole rescued thing? I won't tell you what he does in the book, but he has an interesting job, to say the least. Lennen is sworn to secrecy, but you can tell by the grin on his face that he like the idea. The second raffle was sponsored by Canine Health Events, a diverse gathering of dog lovers from across the country who are dedicated to improving the lives and health of dogs. 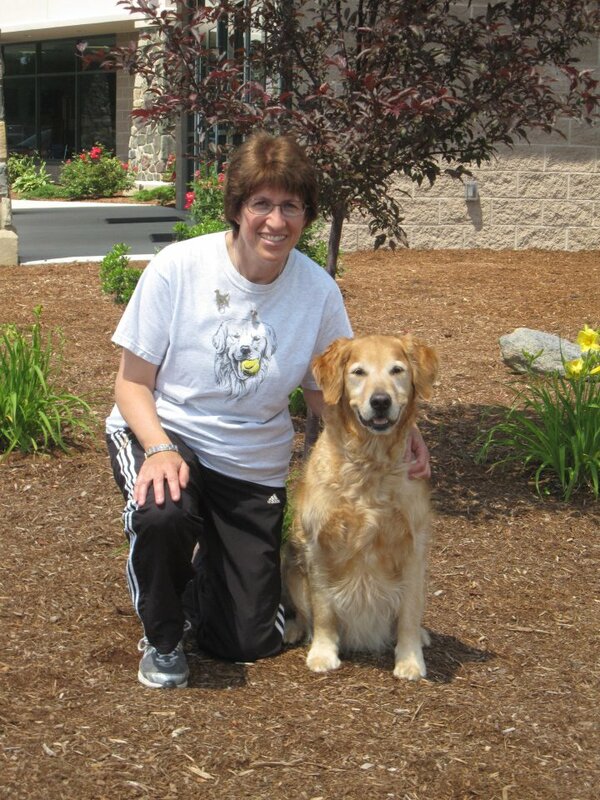 Using normal dog events, they seek to raise money for canine health research both through entry fees and additional fund-raisers, such as raffles, auctions and sponsorships. They held the main part of the raffle online, with additional sales and their drawing at their big agility trial on June 8. I'm delighted to say that CHE raised $2,000 with this raffle, all of which goes to support research on canine health issues. Click here to see the research projects they currently support. The winner of the CHE raffle is Pilot, whose official name is MACH3 V-NATCH Gallopin'Jet Pilot CDX JH FTC WC VCX ADHF CCA CGC PS1. According to owner and compeitition partner Stephanie Schmitter, Pilot "is a very athletic and versatile golden retriever." That should be obvious from his titles! (For the unitiated, he is a Master Agility Champion three times over and has additional titles in agility, obedience and field, with a lifetime ranking of #66 for Golden Retrievers in AKC agility). Stephanie says, "He loves field work and will retrieve on land or in water until you make him stop" - which makes him perfect for this Animals in Focus mystery! Stephanie writes, "Pilot will retrieve just about anything and is very helpful in picking things up around the house, including any shoes left around as well as his food bowl when he is finished eating. But the thing he loves most in life is a tennis ball. Although he is 8 years old, he acts like a puppy when he sees a tennis ball. And he loves to carry 2 balls at a time!" 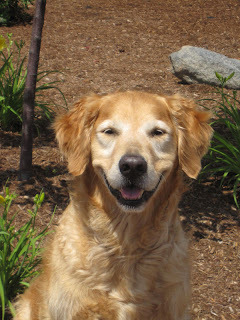 I had to add another picture of Pilot - have you ever seen a better smile? You can read more about Pilot and see some shots of him in action here. I'd like to thank EVERYONE who entered these raffles, because in my book ~ the big book of life ~ you're all winners for supporting such worthwhile causes and having faith in my new mysteries, too. Drop Dead on Recall is available now for pre-release orders from your local bookseller - think Independent! - and online from the usual sources. For more information about the book and the series, please visit my website Mysteries Page, and for immediate news join me on Facebook at my author's page. Hope to see you back here for Writing on Wednesday! Aren't they cute, Marni? Too bad The Money Bird won't be illustrated! What a great way to help raise money and awareness!